The Hopi, meaning “peaceful people”, is a desert tribe from the lands forming the central point of Utah, Arizona, New Mexico, and Colorado. As a people, the Hopi are strongly intertwined with nature, as it was that connection that enabled them to live a productive and abundant lifestyle. This connection was (and continues to be) superior to all of the surrounding tribes and is frequently demonstrated in their symbols. They are experts in craftsmanship and possess exceptional agricultural skills, which has led to the development of many agriculturally-themed symbols and values, especially with corn. These Hopi symbols of values are often depicted through Hopi artistry, which is a very sacred aspect of their culture for them. Hopi express their history, beliefs, dreams and visions through their works of art, baskets, weavings, and pottery. 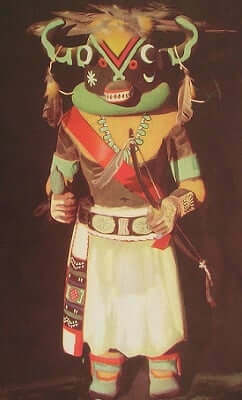 One of the most popular and iconic Hopi symbols of this culture is the Kachina doll and its appropriate costumes. Kachina was said to be the spirit of the sun, governing life and growth while providing abundance to the people. Also called Tawa Kachina, this powerful spirit was one of the most important, and thus highly revered, gods in Hopi tradition. It is depicted using a face with rays projecting from its outer rims in groups of three. This symbol was donned during the yearly solstice ceremony in an attempt to call upon the sun to return and initiate the growing season. As stated above, the Hopi people heavily relied on the harvesting of corn and thus attached much symbolic value to it. They viewed corn as their mother who provided for them in the past and will continue to do so in the future. In their eyes, it was corn that carried them through the four stages of life: birth, childhood, adulthood, and death. In death, the corn allowed each Hopi individual to pass on their heritage, culture, and spirituality. The corn that this tribe cultivated also came in four colors, which were interpreted as being directional in nature. Blue denoted the West, Yellow the North, Red the South, and White the East. Hopi ideology suggests that these colors are what give them a direction for their life plan. It seems fitting, then, that this idea be depicted as an image of a maze. These directions are seen as a direct message from the Creator and will thus enable them to live both peacefully and bountifully. The Hopi spiral meaning also fits in with the theme of journeying along the right path through life. This Hopi symbolic meaning represents the lengthy treks and journeys that a tribe has made – thus, it is not completely unique to the Hopi people. It was typically engraved on stones along the way, with the spiral symbolizing the intricate and sometimes incomprehensible and cyclical nature of the path traveled during the journey. However, this shape also speaks of the need to broaden our awareness and consciousness of our surrounding in order to reach the final destination in our own respective journeys. Another common symbol used by this tribe comes in the form of a circle divided into quarters, each with a circle in its section. 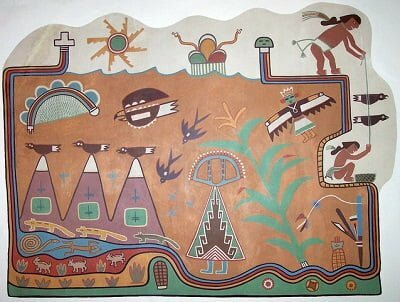 This Hopi symbolism is significant, as it refers to the entire world and its cycles of both seasons and night and day. The central point symbolizes the crossing of the four directions with the outermost point representing the horizon. In a nut shell, this signifies the solstice and equinox points in the calendar. The circles within each section also have their own significance. Hopi people believe that when the Earth was created, there were the first four tribes of mankind. Each circle represents one of the tribes, and each plays a key role in maintaining the balance in the world. There are many more Hopi symbols present in this culture. Symbolism in the Hopi tradition is truly complex in many aspects, and the above mentioned ones are only a kickstart to their world. However, their symbolism can be narrowed down, for general purposes, to be representative of peace, prosperity, and balance for all those on Earth.